COPROCA S.A. was established on April 18, 1991 with the organization of its Board of Directors. Later on November 18, 1994, the production plant in the city of El Alto was opened, and the production of Alpaca "tops" for both the national and international markets was started. 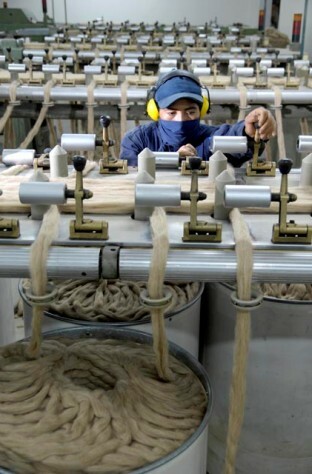 On June 23, 1999, with the economical support of FIA, ATI, the Banco Mercantil and the shareholders of COPROCA S.A.; the yarn producing phase began. This was a further step in adding value to the raw material. From 2005, COPROCA began making high added value hand crafted Alpaca garments. As part of this initiative, COPROCA offers technical assistance and market research to over 350 craftsmen and craftswomen residing in the city of El Alto and several rural communities in the surrounding highlands. Thanks to this expansion the AWAYU fashion production line began in 2008, whose aims for the future are to present modern design garment collections, whilst preserving the cultural arts of the Andes civilizations. These we believe are commendable objectives and it is our earnest desire to continue the expansion of our operations in to bring greater prosperity to the communities of the Bolivian Highlands.